Silicon solar cells have made the conversion of solar energy into electricity possible. The cells are highly efficient and can convert more than 25% of solar energy into usable electricity while simultaneously avoiding the use of extra concentration. The use of these high-efficiency cells has increased the share of solar power in the overall energy supply of the world. However, these cells are not sufficient in desert regions. Rather than being efficient, cells that can withstand the harsh conditions and thrive in dusty regions are required in places like UAE. Accumulation of dirt and dust can drastically affect a panel’s conversion capability and efficiency. A mere four grams of dust on a square meter of solar cell surface can become the proverbial kryptonite and reduce its output by 40%. To prevent loss of energy, solar panels are required to be cleaned on frequent intervals. Large solar fields have cleaning systems to wash the surface of solar panels in order to get rid of the accumulated grime and dirt. In desert regions like UAE, where fresh water is hard to come by, there is an urgent need for new alternative solutions that would not require the use of water to keep the panels clean. The development of such a solution would have the dual benefit of preventing wastage of water and aiding in the achievement of renewable energy goals of UAE. 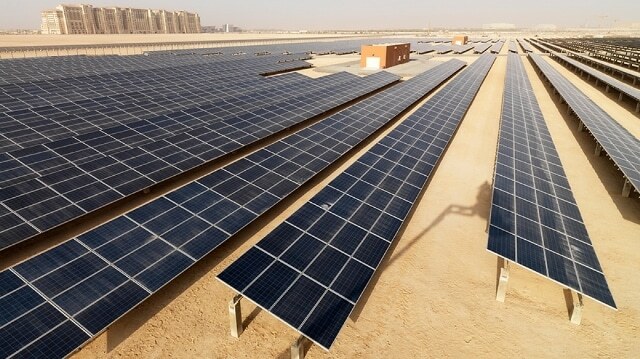 A group of researchers from the Masdar Institute and the Massachusetts Institute of Technology (MIT) has designed a cost-efficient “super coating” that require minimal maintenance and cleaning while not affecting the efficiency of solar panels. Spraying the “super coating” will improve certain important features such as self-healing, anti-static, self-cleaning, anti-reflection and abrasion-resistance of the panels. These key features of solar panels will make them extremely hydrophobic. As such, the water will wash away the dirt and dust on the panel while not sticking to its surface. These features also protect the panel from scratches caused by dust and rocks, making them scratch-resistant. If there is a scratch the panel will automatically repair itself. The anti-reflection property ensures that minimal sun light is reflected off the solar cell into the atmosphere while absorbing large amounts of energy. The panels will also reflect negatively charged dust particles that constitute a large part of UAE’s dust, thereby preventing the panels from becoming dusty. While efforts have been taken for more than a decade to create coating with anti-abrasion, self-cleaning and ant-reflection properties, scientists had not succeeded in creating a coating that can perform all three functions efficiently. The enhancing of one property, say self-cleaning or anti-reflection, leads to the reduced efficiency of the other property, anti-abrasion, of the coating. Developing a coating that would not compromise one property for another has proved to be a challenge. The “super coating” developed by the team has been successfully able to optimize the anti-abrasion, self-cleaning and anti-reflection properties of the panel. In addition, for the first time ever, a coating capable of enhancing the anti-static and self-healing properties have been developed. The team is using clay materials and polymer that are both abundantly available and affordable, to maximize the self-healing property of the coating. These materials cost an approximate of US$2 per kg. The usage of such materials ensures the cost-efficiency and scalability of the coating that is essential for the commercialization of the coating technology. When compared to the standard coating methods that need costly equipment, the coating technique developed by the team is more efficient, cheaper and quicker in coating large, curvy surfaces. The researchers have successfully optimized the properties of self-cleaning, abrasion-resistance and anti-reflection even though they are still in the experimental phase of their study. The researchers are at work, trying to optimize the anti-static and self-healing properties. The team anticipates the completion of the process within one year. The team is a result of a multidisciplinary collaboration, which ensures that the goal of optimizing the “super coating” is approached from all the aspects by capitalizing on the skills and strengths of all the individual team members.